Following on from May’s inaugural GC32 World Championship in Riva del Garda, Italy, the 2018 GC32 Racing Tour sets sail once again next week. 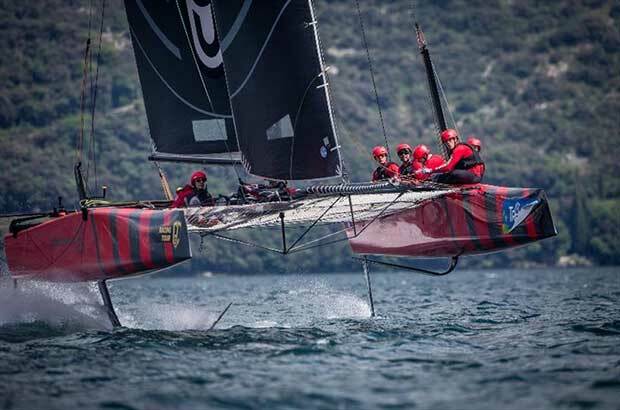 In another first, the European circuit for the one design flying catamarans will visit Portugal and the Algarve coast for the GC32 Lagos Cup, taking place over 27 June-1 July. Thanks to its strategic location, Lagos has a maritime tradition dating back millennia. It was most famous as home to Henry the Navigator and, during Portugal’s ‘Age of Discovery’ in the 15th and 16th centuries, as the favoured port from which renowned Portugese sailors such as Vasco de Gama set off to explore the African continent and beyond. Much evidence of this still exists in its historic town centre. The eight GC32 teams will be undergoing their own voyage of discovery when the four days of racing get underway on Thursday 28 June, following a day of practice racing. This will also be the first time the GC32 Racing Tour has visited a port on the Atlantic but while Lagos faces the open ocean, in fact it is protected both by Cape St Vincent, the southwesternmost tip of Europe just 10km away, and locally by Ponta da Piedade at the west end of Lagos’ bay. Competitors can look forward to sea breeze conditions and flat water – perfect conditions for foiling. For the GC32 Lagos Cup, Código Rojo Racing also has a secret weapon in experienced Portugese multihull sailor Renato Conde who will coach them in Lagos. “It is great to be going to Portugal for the first time. Lagos is an amazing venue – Renato is a local so we are expecting to have fun there,” says Ferioli. The teams competing at the GC32 Lagos Cup are impressively international, representing eight countries and four continents. In addition to Código Rojo Racing and INEOS TEAM UK, the line-up includes two time Melges 32 World Champion Jason Carroll and his Argo team from the USA, while from down under are Simon Hull’s New Zealand team Frank Racing and from Australia Simon Delzoppo’s.film Racing. France is represented by NORAUTO with another America’s Cup skipper at the helm – Franck Cammas, a past Volvo Ocean Race winning skipper, who also won the GC32 Racing Tour in 2016. Then there is Erik Maris’ Zoulou, whose crew mostly sailed with Cammas’ challenge in last year’s America’s Cup. From Switzerland is Realteam, skippered by Jérôme Clerc, back to defend their 2017 GC32 Racing Tour title.